The King Edward VII | Pub Quizzers | Find a pub quiz near you, now. 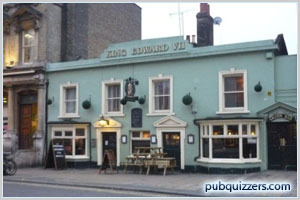 Pub quizzes take place at The King Edward VII, Stratford on Sundays (weekly) at 20:30. Entry is £0.00, you can have up to 8 people on a team. There are prizes of drinks. Happy quizzing! Picture rounds and general knowledge questions take you up to about 10:30pm when the winners are announced. It's free to enter and winners get drinks tokens for the bar. The quiz is good fun, and fast paced. Although it is not free. It costs £2 pp to enter.